A bowl cut and dark brownish-black lipstick? It would seem we've seen this before ... on the runway at Yves Saint Laurent during Fall 2008 Fashion Week, to be exact. 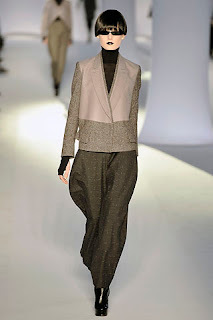 But at the Rachel Roy show during Fall 2009 Fashion Week in New York on February 13, the same trend popped up! Which do like better? I'm totally leaning toward YSL -- it's just cleaner and chicer. Let me know your fave in the comments! I like both, but the Rachel Roy has this retro modern feel that feels a bit softer and a bit more feminine. Somehow it's still space age, but less severe, so to me, it feels more now.